Micrograph of Castleman's disease showing hyaline vascular features including atrophic germinal center, expanded mantle zone, and a radially penetrating sclerotic blood vessel ("lollipop" sign). H&E stain. 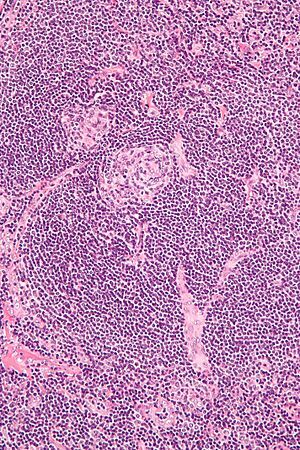 Castleman disease is a group of uncommon lymphoproliferative disorders characterized by lymph node enlargement, characteristic features on microscopic analysis of enlarged lymph node tissue, and a range of symptoms and clinical findings. Castleman disease includes at least 3 distinct subtypes; unicentric Castleman disease (UCD), human herpesvirus 8 associated multicentric Castleman disease (HHV-8-associated MCD), and idiopathic multicentric Castleman disease (iMCD). These are differentiated by the number and location of affected lymph nodes and the presence of human herpesvirus 8, a known causative agent. Correctly classifying the Castleman disease subtype is important, as the three subtypes vary significantly in symptoms, clinical findings, disease mechanism, treatment approach, and prognosis. Castleman disease is named after Dr. Benjamin Castleman, who first described the disease in 1956. The Castleman Disease Collaborative Network is the largest organization focused on the disease and is involved in research, awareness, and patient support. The subtypes of Castleman disease reflect the number of lymph node regions with enlarged lymph nodes and known causes of the disease. In unicentric disease, one or more enlarged lymph nodes are present in a single region of lymph nodes. In multicentric disease, enlarged lymph nodes are present in multiple regions of lymph nodes. The only known cause of Castleman disease is uncontrolled infection with human herpesvirus 8, which has only been reported in cases of multicentric disease. There are three established subtypes of Castleman disease. In unicentric Castleman disease (UCD) one or more enlarged lymph nodes are present in a single region of lymph nodes. It is the most common subtype of Castleman disease and compared to HHV-8-associated MCD and iMCD, symptoms are typically milder, organ dysfunction is uncommon, and surgical removal of enlarged lymph nodes is the treatment of choice. In idiopathic multicentric Castleman disease (iMCD), enlarged lymph nodes are present in multiple lymph node regions and no known cause for the disease is identified. It is less common than unicentric Castleman disease (UCD) and compared to UCD, symptoms are typically more severe, laboratory abnormalities must be present for diagnosis, and medications are used for treatment as surgery is ineffective. In human herpesvirus 8 associated multicentric Castelman disease (HHV-8-associated MCD), enlarged lymph nodes are present in multiple lymph node regions and infection with human herpesvirus 8 is present. It is less common than unicentric Castleman disease and diagnosed most frequently in patients infected with human immunodeficiency virus (HIV). Compared to UCD and iMCD, HHV-8-associated MCD presents with similar symptoms and clinical findings to iMCD. While UCD is readily treatable with surgery, HHV-8-associated MCD, like iMCD, is treated with medications as surgery is ineffective. Hyaline vascular - regressed germinal centers, follicular dendritic cell prominence or displasia, hypervascularity in interfollicular regions, sclerotic vessels, prominent mantle zones with an “onion-skin” appearance. Plasmacytic – increased number of follicles with large hyperplastic germinal centers and sheetlike plasmacytosis (increased number plasma cells). Hypervascular - similar to hyaline vascular features, but seen in iMCD rather than UCD. Includes regressed germinal centers, follicular dendritic cell prominence, hypervascularity in interfollicular regions, and prominent mantle zones with an “onion-skin” appearance. UCD most commonly demonstrates hyaline vascular features, but plasmacytic features or a mix of features may also be seen. iMCD more commonly demonstrates plasmacytic features, but hypervascular features or a mix of features are also seen. All cases of HHV-8-associated MCD are thought to demonstrate plasmablastic features--similar to plasmacytic features, but with plasmablasts present. The clinical utility of subtyping Castleman disease by histologic features is uncertain, as histologic subtypes do not consistently predict disease severity or treatment response. Staining with latency-associated nuclear antigen (LANA-1), a marker for HHV-8 infection, is positive only in HHV-8-associated MCD. Unicentric Castleman disease was first described in a case series by Dr. Benjamin Castleman in 1956. By 1984, a number of case reports had been published describing a multicentric variant of the disease and with some reports describing an association with Kaposi's sarcoma. In 1995, the association between HHV-8 and Castleman disease was described in patients with HIV. In 2017, international consensus diagnostic criteria for idiopathic multicentric Castleman disease (iMCD) were established for the first time. In 2018, the first treatment guidelines for iMCD were established. World Castleman Disease Day was established in 2018 and is held every year on July 23. This date was chosen for Benjamin Castleman's initial case series describing Castleman's disease, which was published in July 1956, and the diagnostic criteria for idiopathic multicentric Castleman's disease, which were published in the journal Blood on March 23, 2017. The Castleman Disease Collaborative Network was founded in 2012 and is the largest organization to be focused on Castleman's disease. It is a global collaborative network involved in research, awareness, and patient support. ^ a b Fajgenbaum DC, Shilling D (February 2018). "Castleman Disease Pathogenesis". Hematology/Oncology Clinics of North America. 32 (1): 11–21. doi:10.1016/j.hoc.2017.09.002. PMID 29157613. ^ a b c Oksenhendler E, Boutboul D, Fajgenbaum D, Mirouse A, Fieschi C, Malphettes M, Vercellino L, Meignin V, Gérard L, Galicier L (January 2018). "The full spectrum of Castleman disease: 273 patients studied over 20 years". British Journal of Haematology. 180 (2): 206–216. doi:10.1111/bjh.15019. PMID 29143319. ^ a b Talat N, Belgaumkar AP, Schulte KM (April 2012). "Surgery in Castleman's disease: a systematic review of 404 published cases". Annals of Surgery. 255 (4): 677–84. doi:10.1097/SLA.0b013e318249dcdc. PMID 22367441. ^ a b c d e f g Fajgenbaum DC, Uldrick TS, Bagg A, Frank D, Wu D, Srkalovic G, et al. (March 2017). "International, evidence-based consensus diagnostic criteria for HHV-8-negative/idiopathic multicentric Castleman disease". Blood. 129 (12): 1646–1657. doi:10.1182/blood-2016-10-746933. PMC 5364342. PMID 28087540. ^ a b c Keller AR, Hochholzer L, Castleman B (March 1972). "Hyaline-vascular and plasma-cell types of giant lymph node hyperplasia of the mediastinum and other locations". Cancer. 29 (3): 670–83. PMID 4551306. ^ Liu AY, Nabel CS, Finkelman BS, Ruth JR, Kurzrock R, van Rhee F, Krymskaya VP, Kelleher D, Rubenstein AH, Fajgenbaum DC (April 2016). "Idiopathic multicentric Castleman's disease: a systematic literature review". The Lancet. Haematology. 3 (4): e163–75. doi:10.1016/S2352-3026(16)00006-5. PMID 27063975. ^ a b Castleman, B.; Iverson, L.; Menendez, V. P. (July 1956). "Localized mediastinal lymphnode hyperplasia resembling thymoma". Cancer. 9 (4): 822–830. ISSN 0008-543X. PMID 13356266. ^ Chen KT (April 1984). "Multicentric Castleman's disease and Kaposi's sarcoma". The American Journal of Surgical Pathology. 8 (4): 287–93. PMID 6711739. ^ Soulier J, Grollet L, Oksenhendler E, Cacoub P, Cazals-Hatem D, Babinet P, et al. (August 1995). "Kaposi's sarcoma-associated herpesvirus-like DNA sequences in multicentric Castleman's disease". Blood. 86 (4): 1276–80. PMID 7632932. ^ van Rhee, Frits; Voorhees, Peter; Dispenzieri, Angela; Fosså, Alexander; Srkalovic, Gordan; Ide, Makoto; Munshi, Nikhil; Schey, Stephen; Streetly, Matthew (2018-09-04). "International, evidence-based consensus treatment guidelines for idiopathic multicentric Castleman disease". Blood: blood-2018–07-862334. doi:10.1182/blood-2018-07-862334. ISSN 1528-0020. PMID 30181172. ^ Fajgenbaum, David C.; Ruth, Jason R.; Kelleher, Dermot; Rubenstein, Arthur H. (April 2016). "The collaborative network approach: a new framework to accelerate Castleman's disease and other rare disease research". The Lancet. Haematology. 3 (4): e150–152. doi:10.1016/S2352-3026(16)00007-7. ISSN 2352-3026. PMID 27063967. This page was last edited on 18 March 2019, at 07:02 (UTC).